The battery storage, smart grid and energy efficiency sectors are seeing dramatic growth. 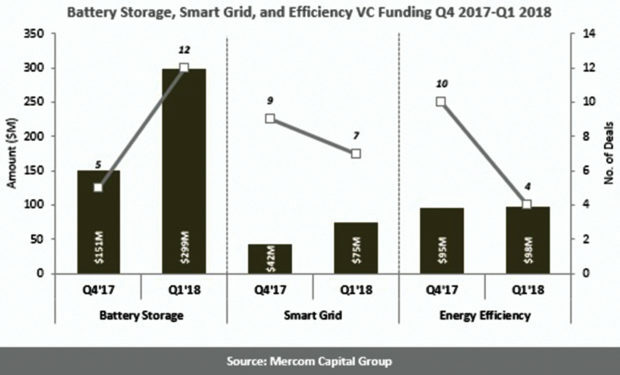 Mercom Capital Group, a global clean energy communications and consulting firm, released its report on funding and mergers and acquisitions (M&A) activity for the battery storage, smart grid, and energy efficiency sectors for the first quarter of 2018. Corporate funding in battery storage came to $299-million in twelve deals compared to $154-million in six deals in the fourth quarter of 2017. In a year-on-year (YoY) comparison, $80-million was raised in ten deals in the first quarter of 2017. Fig. 1: Battery storage, smart grid, and efficiency venture capital funding for the period Q4, 2017 to Q1, 2018. Venture capital (VC) funding (including private equity and corporate venture capital) raised by battery storage companies in the first quarter of 2018 jumped to $299-million in twelve deals from $151-million in five deals in the fourth quarter of 2017 due to some large deals in the quarter. Year-on-year, funding was significantly higher compared to the $58-million raised in eight deals in the first quarter 2017. Fifteen investors participated in battery storage funding this quarter with energy storage systems companies raising the most. There were four M&A transactions involving battery storage companies in the first quarter of 2018, although the financial details of the transactions were not disclosed. In the fourth quarter of 2017 and the first quarter of 2017, there was one M&A transaction each that did not disclose a transaction amount. Corporate funding in smart grid came to $1,3-billion in nine deals compared to $796-million in twelve deals in the fourth quarter of 2017. In a YoY comparison, $164-million was raised in 14 deals in the first quarter of 2017. VC funding for smart grid companies increased 79% in the first quarter of 2018 with $75-million in seven deals compared to $42-million in nine deals in the fourth quarter of 2017. In a YoY comparison, in the first quarter of 2017 $164-million was raised in 14 deals. The top VC funded smart grid companies included: Bidgely, which secured $27-million from Georgian Partners, Khosla Ventures, E.ON, innogy, and Constellation Technology Ventures; Husk Power Systems received an equity investment of $20-million from Shell Technology Ventures, Swedfund International, and ENGIE Rassembleurs d’Energies; and Mnubo raised $16,5-million from HSB Group. Fifteen investors participated in smart grid VC funding rounds this quarter with smart grid communications companies raising the most. A combined $1,3-billion was raised in two debt financing deals in the first quarter of 2018, compared to $754-million raised in three deals in the fourth quarter of 2017. One M&A transaction was announced in the first quarter of 2018 but it did not disclose a transaction amount, compared to eight transactions (two disclosed) in the fourth quarter of 2017. In a YoY comparison, there were seven M&A transactions in the first quarter of 2017. Corporate funding in energy efficiency came to $104-million in five deals compared to $916-million in 14 deals in the fourth quarter of 2017. In a YoY comparison, $514-million was raised in 17 deals in the first quarter of 2017. VC funding raised by energy efficiency companies in the first quarter of 2018 remained steady at $98-million in four deals compared to $95-million in ten deals in the fourth quarter of 2017. In a YoY comparison, $213-million was raised in 14 deals in the first quarter of 2017. The Top Efficiency deals included $61-million raised by ecobee from Energy Impact Partners and eight institutional investors including Thomvest, Relay Ventures, and the Amazon Alexa Fund; the $27-million raised by Carbon Lighthouse from GRC SinoGreen Fund, JCI Ventures, SV Tech Ventures, EBay founder Pierre Omidyar’s Ulupono Initiative, Ekistic Ventures, Tom Steyer’s Radicle Impact Partners, former General Motors Vice Chairman Steve Girsky, and Tesla Chief Technology Officer Jeffrey B. Straubel; and the $10-million received by Petros PACE Finance from former Major League Baseball player Alex Rodriguez and his investment firm A-ROD. Fifteen investors participated in VC funding this quarter. Within the sector, temperature control companies brought in the most funding. Debt and public market financing for efficiency companies fell to $6-million in one deal this quarter compared to $621-million in three deals in the last quarter of 2017. In the first quarter of 2018, there was one M&A transaction (transaction details not disclosed) while in the last quarter of 2017, there were three M&A transactions (all undisclosed). In the first quarter of 2017, there were four M&A transactions in the energy efficiency sector, two of which disclosed transaction details. The post Battery storage, smart grid, and efficiency companies raise millions in funding appeared first on EE Publishers.